Drain cleaning machines offer a more powerful alternative for home owners and professional plumbers to clear out clogged drains than traditional snakes (Source). Many homeowners opt to purchase a lightweight, auto-feeding drain cleaner like the Ridgid K-30 because it quickly pays for itself unclogging nasty debris from home sinks rather than calling in a plumber for several hundred bucks (Source). If you need to clear out root blockages, you'll need something more powerful, like the 215 lb. Cobra Products drain cleaning machine. It's important to note that while these drain cleaners are advertised as 'electric', you'll still have to manually feed the hose into the drain, with kinking issues on retraction being a notable difficulty. They also commonly ship with different attachments like bulb augers, "C" cutters, and spade cutters to help clear out different blockages. The 11 lb. Ridgid 34963 is best for light, residential use- dealing with debris clogs in bathroom sinks and tubs and potentially clearing out kitchen sink clogs as long as the line is not too long. It's the lightest option, while the wheeled Cobra Products drain cleaning machine is the heaviest at 215 lbs, and is a significantly more powerful option. It's engineered to clean out 4" to 10" diameter lines- specifically intended for sewer lines, main drains, and handling root blockages. ​The Cobra Drain cleaning machine can deal with the largest diameter pipes- 4" to 10", while the other options max out at 4" pipes (check the comparison table below for more info). The Cobra electric drain cleaner ships with a 3/4" x 100' slotted end cable as well as a 4 piece cutter set. Its 3/4 HP motor includes a forward-off-reverse switch as well as a manual thermal overload protector switch. It's designed to clean out 4" to 10" lines and is indicated for use on sewer lines main drains, and root blockages. The Ridgid 52363 K-400 Drum Drain Cleaning Machine 3.9 $$$ 65 lbs 1.5" to 4"
The Ridgid 34963 K-30 Sink Drain Cleaner 4.1 $ 11 lbs .75" to 1.5"
The Cobra Products GIDDS-211332 Drain Cleaning Machine 4.0 $$$$ 215 lbs 4" to 10"
The Pacific Hydrostar Compact Electric Drain Cleaner 3.6 $$ 76 lbs 1" to 4"
The Ridgid 58920 K-50 Sectional Drain Cleaning Machine 4.2 $$$ 32 lbs 1.25" to 4"
This drain cleaning machine offered by Ridgid is powerful, well-built, and suitable for drain cleaners and plumbers. Users love the retractable handle for easy maneuvering, but some do note there is no auto feed. The Ridgid drain machine measures 36” x 36” x 36”, and it features a sleek profile, a cart system of transport, a C-32 3/8-inch x 75-foot integral wound solid core cable, which is ideal both for slop sinks and kitchen sinks, and a weight of 65 pounds. Another great thing about this machine is that it features a cable control system that stops the drum from spinning when the blade gets stuck. The package also includes Ridgid working gloves and a T-260 tool set which consists of T-202 bulb auger, T-205 “C” cutter, T-211 spade cutter, and A-13 pin key. If you are searching for a way to clear clogged sinks, you might take a look at this sink drain machine offered by Ridgid. Users love the auto feed control that keeps your hands clean, but some do note that there are no color strips to indicate how much cable you have fed into the drain. 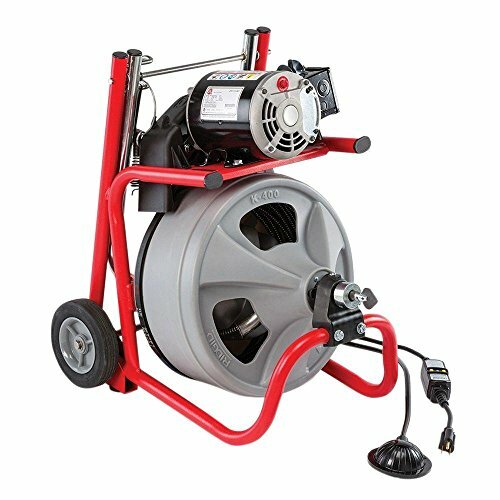 The Ridgid drain cleaning machine measures 10” x 17” x 11”, and it features a single phase motor which is CSA approved, aluminum paddles for 20% faster advance of the cable, a 30-feet of 1/4-inch cable, and a weight of 11 pounds. Another great thing about this machine is that it doesn’t require too much set up and there is on/off foot switch. A reviewer comments that he used the Ridgid cleaning machine to clear a bogged kitchen drain and that it worked far better than he expected. He advises that you read the instructions carefully and watch some YouTube videos to avoid making mistakes. Another buyer observes that the machine drains fast and efficiently and that it’s very easy to use it thanks to the simple design. He adds that it took him less than 10 minutes to clean his sink drain and that he highly recommends it. A user also shares that the machine is well-built and that it’s of invaluable help in a difficult situation. However, some customers have said that they find the drain machine hard to use and that they had issues with the cable. The Cobra drain machine measures 31” x 24” x 36”, and it features a 3/4 capacitor motor with a forward/off/reverse switch, a manual thermal overload protector switch, a weight of 215 pounds, and a 3/4 inch x 100′ slotted end cable. Another great thing about this machine is that you can use it for cleaning four to ten-inch lines. An online reviewer mentions that he is very impressed with the quality of the Cobra Products drain machine and that it’s one of the best options for cleaning bogged sinks or drains. He adds that the machine works efficiently and that he highly recommends it. Another buyer comments that he is very happy with his purchase and that the cleaning machine is very easy to figure out. He says that he was surprised by the heavy-duty material and that he expects that the machine will last for years. A user also notes that after 12 months, he still doesn’t have any issues with the Speedway drum drain machine and that it works just like he expected. However, a customer has said that the cable feed gear stopped working after a couple of drains and that he can’t find replacement parts. Another purchaser also complains that the cable is hard to untangle. This electric drain cleaning machine offered by Pacific Hydrostar is affordable, easy to store, and well-designed. Users love the 1/2″ x 50 ft. wire core cable that is tangle-resistant, but some do note that it arrived broken. The Pacific Hydrostar compact drain cleaner measures 13-1/4″ x 17-1/4″ x 21-1/4″, and it features four interchangeable heads – a spade cutter, a boring bulb cutter, a1-1/2″ arrow cutter, a 1-1/4″ C-cutter, a durable steel frame, a 1/3 HP motor, and a weight of 76 pounds. Another great thing about this cleaner is that it features a sealed air-activated foot switch, and it has a built-in GFCI. This compact electric drainer is suitable for pipes from 1″ ID to 4″ ID. A reviewer shares that this is one of the best compact drain cleaning machine that he has owned and that it’s very easy to figure out how to use it. He highly recommends it to anyone who needs a compact tool to clean his kitchen sink. Another buyer observes that the drain machine managed to clean a problematic drain with no issues and that he is very impressed with its performance. A user adds that the motor works quietly and that it unclogs sinks fast if you read the instructions carefully. However, some customers have said that the electric drain cleaner broke quickly and that it’s difficult to get cable back into the machine because it gets tangled. If you are looking for an innovating drain machine, you might consider this sectional drain cleaning machine offered by Ridgid. Users love the unique, instant-acting cable clutch for maximum operator control, but some do note that it’s expensive. 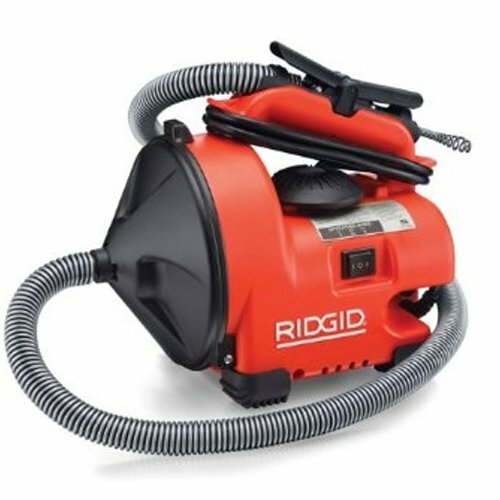 The Ridgid cleaning machine measures 14 x 13 x 18 inches, and it features a weight of 32 pounds, a 300-w reversible motor which is great because it spins the cable with 400 RMP. Another great thing about this machine is that it’s CSA approved, and you can use the following section-type drain cables – 5/16 inch, 3/8-inch and 5/8-inch diameter. However, be aware that they are not included in the package. A buyer comments that this is one of the best sectional drain cleaning machines for bogged drains and that it works far better that he anticipated at the beginning. He says that he highly recommends it to anyone looking for a compact, easy-to-use drain machine. Another reviewer observes that the cleaner machine doesn’t have any issues with unclogging sinks, but he is disappointed that he had to purchase the cables separately. A user also notes that the machine arrived quickly and that there were no problems with the package. He states that the drain sink machine matches the provided description and that he doesn’t have any complaints regarding its functionality and performance. 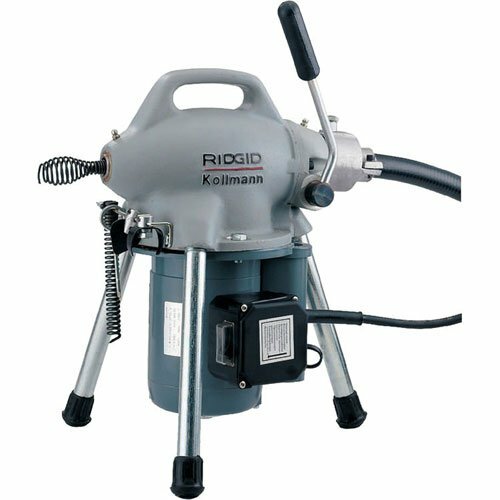 The first drum-style drain cleaning machine we examined is manufactured by Ridgid. 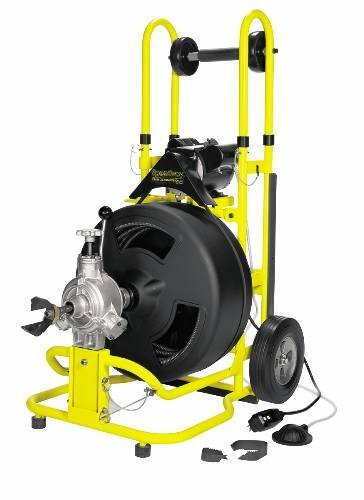 It has a 100-foot drum capacity and a 3/8 inch diameter cable designed for professional plumbers, property managers, drain cleaners and corporate janitorial and maintenance professionals. They say that while it is incapable of removing root blockages, it is engineered to clear out difficult drain blockages in an easy and intuitive way. Contained in a cart, it's built to be highly maneuverable, making it easy to transport to job sites as well as to store. It features a cable control system that causes the drum to cease spinning whenever its blade gets lodged into a blockage- this ensures that the drain snake cable isn't damaged in the process. As the torque mounts, the drain cleaning machines outer spring will tighten on the wire core, helping to transfer large amounts of torque to the cutter. Buyers tell us that it cleans pipes 8 inches and larger in diameter, doesn't come with an auto feeder, and the cable is 75 feet long. The second auto cleaning sink machine we examined is another Ridgid drain cleaner. 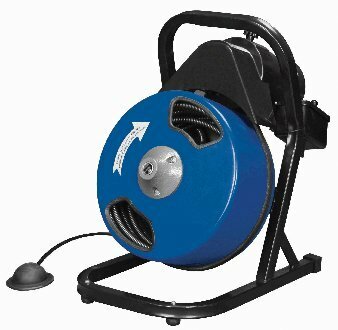 It's advertised as an auto feeding drain cleaning tool with a single phase motor that rotates the cable at 450 revolutions per minute and includes integrated foot bulb activation. Because it is especially lightweight at only 11 pounds, it is especially portable option and designed with proprietary paddles that the manufacturer describes as advancing cable up to 20% faster than other models. One buyer we interviewed said that it is easy to use and sets up quickly, helping to clear out drains more powerfully than using a traditional manual snake. They tell us that it energetically withdraws debris out of drains, employing a forward rotation while the snake is retracted from the drain- this means that the clogged debris is gripped onto as it's withdrawn. Buyers were also impressed by the foot-activated power switch- because it is designed with this feature, the operation is hands-free and allows you to manage the cable better. On the downside, some reviewers say that the auto feed can be difficult to use because it's hard to determine if it's actually causing the cable to move or not. Another bit of feedback is that because there isn't any visual indicator that demonstrates how much of the cable has been inserted into the drain, you're sort of left in the dark- some enterprising users have marked off the cable with measure demarcations to make this clear for them. One homeowner purchased it because his bathtub routinely gets clogged and using traditional manual snakes had been ineffective. Indeed, this homeowner was pleasantly surprised at how easy this auto cleaning drain machine was able to deal with disgusting clogs in bathroom sinks, bathtubs and kitchen areas. Other reviewers concur, saying that machine pays for itself almost immediately because it can cost several hundred dollars oftentimes to get a plumber out to the house for doing a relatively simple drain declogging. One institutional purchaser who works as part of a janitorial team for a network of hotels says that this little drain cleaning machine has been a handy, portable option to remove hair clogs from hotel room vanity sinks. The third drain cleaning machine we examined is provided by Cobra Products- it ships with a 100-foot slotted end cable as well as a four piece cutter set. This is a more powerful option and is designed to clean 4-inch to 10-inch diameter lines- particularly useful for sewer lines, main drains and root blockages. Buyers describe it as a particularly heavy duty option that for most users has withstood frequent, rugged use. Indeed, buyers say that it can withstand heavy operational use, though it is pretty heavy so not incredibly portable, with reviewers saying that in their experience it has lasted up to 18 months before having to replace it. The fourth electric drain cleaning drum machine we examined is provided by Pacific Hydrostar. It's designed to handle pipes measuring 1-inch to 4-inches in diameter with a 50-foot wire cable designed it to be anti-kink, and tangle. It does ship with four different interchangeable heads- a spade cutter that is designed to cut through stoppages, and boring bulb cutters that are meant to push through stoppages. The electrical component spins the drum, but you should understand that you actually have to manually insert and withdraw the snake yourself. There is some mixed feedback for this device, with some reviewers endorsing its ability to easily clear out root clogs, especially for roots that have invaded piping and plumbing systems. Other homeowners complain that the foot switch was defective- because they were unable to find a replacement part the machine was effectively useless for them. 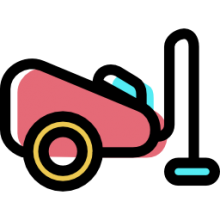 Other buyers say that this is a pretty heavy machine, especially for residential use, and while it provided a powerful declogging solution it might be better to go with a wheeled option for enhanced maneuverability in the home. Another reviewer says that it did the job for him, helping him to clear out a main line pipe that ran out into the street- cheaper than hiring a plumber, so it effectively paid for itself in a single use. The last sectional drain cleaning machine we examined is another Ridgid option- it's marketed as including an instant-acting cable clutch to make it easy for operators to use. The way it works is that you pull the handle down and the cable spins- whenever you release the handle the cable will immediately stop. It's built with a 300 W reversible motor providing 400 revolutions per minute drain cleaning cable spinning- great for floor drains, showers and sinks. It works with three different sizes of cable- 5/16 inch, 3/8 inch and 5/8 inch and is designed to clean out 1.25-inch to 4-inch drain lines. Be advised, reviewers say that it doesn't ship with a rear hose guide- it's the machine only. Other reviewers endorsed it as the best building snake machine they have ever used. Because the company provides a lifetime warranty, many reviewers were convinced to make the purchase from this brand in the hopes that any malfunctions would be covered by this assurance.